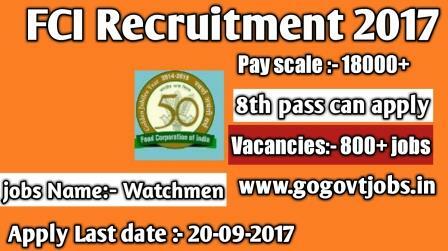 Food Corporation of India is going to recruit fresher candidates in India for Watchmen Jobs. 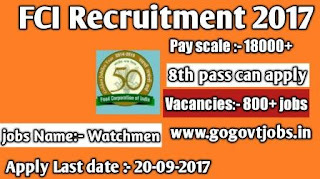 Now you can Apply this FCI Watchmen jobs before 20-September-2017. Only those candidates are eligible who have passed 8th Standard. Education Criteria :- Only those candidates are eligible who have passed 8th Standard. Age Criteria :- Candidates age Limit should to be possess minimum age 18 years & Maximum age 25 years. candidates who meet all eligible criteria related to these 8th pass job will be selected on the basis of their performance in various round of selection. Selection will be held on Physical Endurance Test.